More than 70 eager and excited hockey players made their way to the Little Bands Hockey Tournament in Sioux Lookout yesterday. Five teams left with coaching staff and chaperones on the winter road to participate in the annual hockey event from February 10 to 14. Games are scheduled at the Sioux Lookout and Eagle Lake arenas. All the best to Sandy Lake's young hockey players, we are cheering for you! 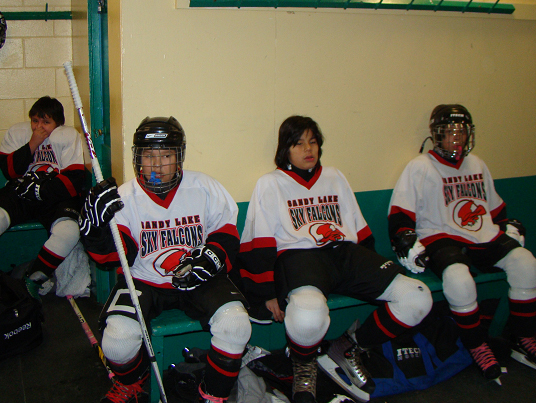 Sandy Lake's Sky Falcons get ready for their first game against Deer Lake this morning at 7:00 a.m.. They tied 6-6.